Nairobi ( pronounced [ˈnaɪɹəʊbiː]) is the capital of Kenya. Founded in 1899, the city was handed capital status from Mombasa in 1907. It is also the capital of the Nairobi Province. The city lies on the Nairobi River, in the south of the nation, and has an elevation of 5450ft (1661m) above sea-level. The area was an essentially uninhabited swamp until in 1899 a supply depot of the Uganda Railway was built, which soon became the railway's headquarters. The city was named after a water hole known in Maasai as Ewaso Nyirobi, meaning "cool waters". It was totally rebuilt in the early 1900s after an outbreak of plague and the burning of the original town. Nairobi replaced Mombasa as the capital of the British East Africa Protectorate in 1905. The railway brought wealth into the city, which made it grow dramatically. It then became Kenya's second largest town after Mombasa. In 1901 it became the capital of the British protectorate, and the city grew around administration and tourism, initially in the form of big game hunting. As the British colonialists started to explore the region, they started using Nairobi as their first port of call. This prompted the colonial government to build several grand hotels in the city. The main occupants were British game hunters. Nairobi continued to grow under the British rule, and many British peoples settled within the city's suburbs. The continuous expansion of the city began to anger the Maasai people, as the city was devouring their land to the south. It also angered the Kikuyu people, who wanted the land returned to them. In 1919, Nairobi was declared to be a municipality. Between the years of 1920 and 1950, the number of white settlers within Nairobi rose from 9,000 to 80,000. There was, however, friction that existed between these settlers and the local peoples. Nairobi was granted city status in 1954. After the end of World War II, this friction developed into the Mau Mau rebellion. Jomo Kenyatta, Kenya's future president, was jailed for his involvement even though there was no evidence linking him to the rebellion. Pressure exerted from the locals onto the British resulted in Kenyan independence in 1963, with Nairobi as the capital of the new republic. After independence, Nairobi grew rapidly and this growth put pressure on the city's infrastructure. Power cuts and water shortages were a common occurrence, though in the past few years better city planning has helped to put some these problems in check. The U.S. Embassy in Nairobi was bombed in August 1998 by Al-Qaida, killing over 200 civilians, one of a series of U.S. embassy bombings. It is now the site of a memorial park. Nairobi is a cosmopolitan and multicultural religious city, with many immigrants from former British colonies, including India, Somalia and Sudan. This is highlighted in the number of churches, mosques, temples and gurdwaras within the city. As a reflection of the cities multicultural composition, the night life offers a diverse range of watering holes. Nairobi has the informal title "The Green City in the Sun." Perhaps the most famous book and film set in Nairobi, is Out of Africa. The book was written by Karen Blixen (pen name Isak Dinesen), and it is her account of living in Kenya. Karen Blixen lived in the Nairobi Area from 1917 to 1931, and the neighbourhood in which she lived, Karen, is named after her. In 1985, Out of Africa was made into a film, directed by Sydney Pollack. The film won 28 awards, including 7 Academy Awards. The popularity of the film prompted the opening of Nairobi's Karen Blixen Museum. The city is located at 1°16′S 36°48′E and occupies around 150 km². It is situated about 1660 metres (5450 ft) above sea level. 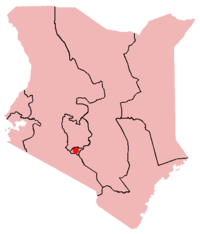 Nairobi is situated between the cities of Kampala and Mombasa. It is close to the eastern edge of the Rift Valley. As Nairobi is adjacent to the Rift Valley, minor earthquakes and tremors occasionally occur. The Ngong hills, located to the west of the city, are the most promenant geographical feature of the Nairobi Area. Mount Kenya is situated north of Nairobi and Mount Kilimanjaro is towards the south-east. Both mountains are visible from Nairobi on a clear day. The Nairobi River and its tributaries traverse through the Nairobi Province. Nobel Peace Prize laureate Wangari Maathai has fought fiercely to save the indigenous Karura Forest in northern Nairobi which is under threat of being replaced by housing and other infrastructure. Nairobis western suburbs stretch all the way from the Kenyatta National Hospital in the south to the UN headquarters and Gigiri in the north - a distance of about 20 km. The city centres on City Square, around which lie the Kenyan Parliament buildings, the Holy Family Cathedral, Nairobi City Hall, Jomo Kenyatta's mausoleum and the most upmarket shops. It also has the Kenya National Theatre, Kenya National Archives, Mzizi Arts Centre and Kenyatta International Conference Centre. Other attractions include the Ramoma Rahimtulla Museum of Modern Art, All Saints Cathedral and several markets. At 1860 metres, Nairobi enjoys a fairly moderate climate. The altitude makes for some chilly evenings, especially in the June/July season when the temperature can drop to 10°C . The sunniest and warmest part of the year are from December to March, when temperatures average the mid-twenties during the day. The temperature usually peaks at 25 °C. There are two rainy seasons but rainfall can be moderate. The cloudiest part of the year is just after the first rainy season, when, until September, conditions are usually overcast with drizzle. As Nairobi is situated close to the equator, the differences between the seasons are minimal. The seasons are referred to as the wet season and dry season. The timing of sunrise and sunset do not vary tremendously throughout the year. Nairobi has many parks and open spaces throughout the city. 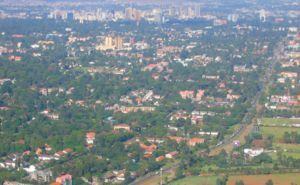 Most of Nairobi is green-space, and the city has dense tree-cover. The most famous park in Nairobi is Uhuru Park. The park borders the central business district and the neighbourhood Upper Hill. Uhuru (Freedom) Park is a centre for outdoor speeches, services and rallies. The park was to be built-over by former President Daniel Arap Moi, who wanted his party's 60-storey headquarters situated in the park. However, the park was saved by Wangari Maathai, who later won a Nobel Peace Prize for her efforts. Central Park is adjacent to Uhuru Park, and includes a memorial for Jomo Kenyatta, the first president of Kenya. Other notable open spaces include Jeevanjee Gardens, City Park and Nairobi Arboretum. 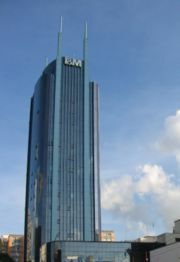 Headquarters for the I&M Bank in Nairobi. Several of Africa's largest companies are headquartered in Nairobi. KenGen, which is the largest African stock outside South Africa , is based in the city. Kenya Airways, Africa's 2nd largest airline, uses Nairobi's Jomo Kenyatta International Airport as a hub. Nairobi is the regional headquarters of several international companies and organizations. This makes it one of the most influential cities in Africa. The United Nations has strong presence in Nairobi, as two of its departments, UNEP and UN-Habitat have headquarters in Nairobi. Goods manufactured in Nairobi include clothing, textiles, building materials, processed foods, beverages and cigarettes. Several foreign companies have factories based in and around the city. This includes Firestone and Goodyear, which have factories on the Mombasa Road. Most industries in Nairobi are based to the east of the city. 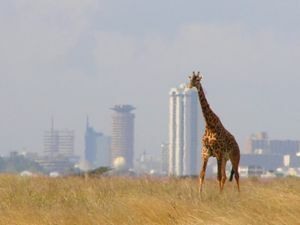 A lone giraffe at Nairobi National Park, with Nairobi's skyline in background. Nairobi is not a prime tourist destination, but it does have several tourist attractions. The most famous is the Nairobi National Park. The national park is unique, in being the only game-reserve of this nature to border a capital city, or city of this size. The park contains many animals including lions and giraffes. The park is home to over 400 species of bird , which is more than the entire British Isles . Nairobi has several museums. These include the Nairobi Railway Museum and the National Museum of Kenya, which houses many artefacts including the full remains of a homo erectus boy. The National Museum is currently closed due to renovation, but is due to be reopened in 2007. Nairobi is also home to the largest ice rink in Africa, the Panari Sky Centre. The rink covers 15,000 square metres and can accommodate 200 people. 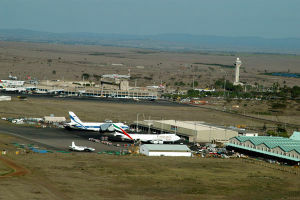 An aerial of the cargo terminal at Jomo Kenyatta International Airport, the largest and busiest airport in East Africa. Nairobi is served primarily by Jomo Kenyatta International Airport. It is the largest airport in East and Central Africa and handled over 4 million passengers in 2005. The airport is a major transit hub for passengers flying to East Africa's natural attractions, and other smaller African cities. The airport is situated 20km from Nairobi's Central Business District, and is served by taxis, shuttle services and coaches. The airport directly serves intercontinental passengers from Europe and Asia. Wilson Airport is a small, busy airport to the west of Nairobi. It handles small aircraft that generally operate within Kenya, although some offer services to other East African destinations. Eastleigh Airport was the original landing strip in the pre- jet airline era. It was used in a landing point on the 1930s and 1940s British passenger and mail route from Southampton to Cape Town. This route was served by flying boats between Britain and Kisumu and then by land-based aircraft on the routes to the south. The airport is now a military base. A Nairobi Matatu, after the regulation changes. Buses are the most common form of public transport in Nairobi. Matatus, privately owned minibuses, are the most popular form of local transport, and generally transport up to 12 people. Matatus operate within Nairobi and from Nairobi to other towns. The matatu's destination is imprinted on the side of the bus. Matatus were easily distinguishable by their extravagant paint schemes. Owners would paint their matau with their favourite football team or hip hop artist. They were notorious for their poor safety records, which was a result of overcrowding and reckless driving. Matatu drivers were pressured to make as many round trips as possible to maximize profits for their operator. 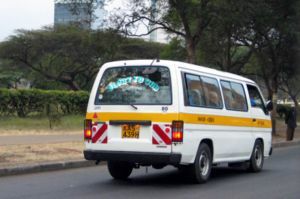 However, in 2004 a law was passed in which all matatus had to include seat-belts, speed governors, and all be painted in a uniform white with yellow band across it. At first, this caused a furore amongst matatu operators, but they were pressured by government and public pressure to make the changes. The limit to matatus is now 80 kph. Citi Hoppa is the newest bus fleet operating in Nairobi. Run privately, the Citi Hoppa offer modern buses on many routes within the city. The Citi Hoppa buses are distinguishable by their green livery. Nairobi was founded as a railway town, and the Kenya Railways (KR) main headquarters are still situated there, near the city centre. The line runs through Nairobi, from Mombasa to Kampala. Its main use is freight traffic, but regular nightly passenger trains connect Mombasa, Nairobi and Kisumu. A number of morning and evening commuter trains connect the centre with the suburbs, but the city has no proper light rail, tramway or subway lines. A JKI airport shuttle rail service is being contemplated. Nairobi is also the junction for a branch railway to Nanyuki. 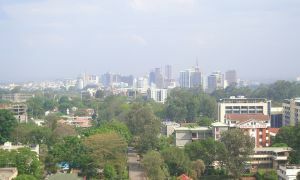 Nairobi grew around the central business district. It takes a rectangular shape, around the Uhuru Highway, Haille Selasse Avenue, Moi Avenue and University Way. It includes many of Nairobi's important buildings, including the City Hall and Parliament Building. The city square is also located within the perimeter. A feature of the central business district that strikes foreign tourists the most is the skyline. Nairobi's skyline has been compared to many Asian and American cities. This is due to a construction boom after independence, and another construction boom in the late 1990s and early 2000s. Most of the skyscrapers in this region are the headquarters of businesses and corporations, such as I&M. The United States Embassy bombing took place in this district, prompting the new embassy building to be located in the suburbs. The district is bordered to the south-west by Nairobi's largest park: Uhuru Park and Central Park. The Mombasa to Kampala railway runs to the south-east of the district. Today, many businesses have, or are considering relocating or establishing their headquarters outside the Central Business District. This is because land is cheaper, and better facilities can be easily built and maintained elsewhere. Two areas that are seeing a growth in companies and office-space are Upper Hill, approximately 2 km from the CBD and Westlands, approximately the same distance. Companies that have moved from the CBD to Upper Hill include Citibank. To accommodate the large demand for floorspace in Nairobi, various commercial projects are being constructed. New business parks are being built along Mombasa Road, including the flagship Nairobi Business Park. Nairobi is currently being considered by a Middle-Eastern company, interested in building a high-rise headquarters in Africa. Between 500,000 and a million people in Nairobi live in the Kibera slum, the largest and poorest slum in Africa. Nairobi is home to several slums. The growth of these slums is a result of migration from rural areas to the capital. Unable to find work, these migrants settle in the slums. Kibera is the largest and poorest slum in Africa , and is situated to the west of Nairobi. Between 500,000 and 1 million people live in Kibera, which dates from a 1920 settlement for Nubian soldiers ("Kibera" is the Nubian word for "forest"). The slums cover two square kilometres and is on government land. Kibera has been the setting for several films, the most recent being the Constant Gardener. Other notable slums include Mathare and Korogocho. Among other low and lower-middle income estates are Kariokor, Dandora, Kariobangi, Embakasi, Huruma and Dagoretti. Somali immigrants have settled in Eastleigh, nicknamed 'Little Mogadishu'. A typical Nairobi residental suburb, with the Central Business District in the distance. Most Nairobi non slum-dwellers live in relatively good housing conditions. Large houses can be found in many neighbourhoods, especially to the west of Nairobi. Historically, British immigrants have settled in Langata and Karen. Other middle and high income estates include Parklands, Westlands, Hurlingham, Milimani and Nairobi Hill. To accommodate the growing middle-class, many new apartments and housing developments are being built in and around the city. The most notable development is Greenpark, at Athi River town, 25 km from Nairobi's CBD. Over 5,000 houses, villas and apartments are being constructed at this development, including leisure, retail and commercial facilities. The development is being marketed at families, as are most within the city. Nairobi has struggled with rising crime, earning a reputation for being a dangerous city and the nickname "Nairobbery". 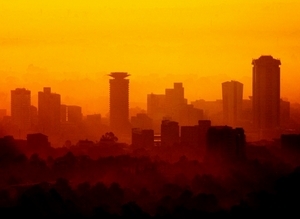 In 2001, the United Nations International Civil Service Commission rated Nairobi as among the most insecure cities in the world, classifying the city as " status C." The head of one development agency cited the "notoriously high levels of violent armed robberies, burglaries and carjackings." Crime had risen within Nairobi, as many people left the countryside for the city. Due to their lack of wealth, they are left with no option but to settle in slums such as Kibera. Most large houses now have a watchguard, burglar grills on windows and doors, and dogs to patrol their grounds during the night. Tourists are advised not to show valuables, and try to avoid the city centre at night. Nairobi is home to several prestigious universities. The University of Nairobi is the oldest university in Kenya. It was established in 1956, as part of the University of East Africa, but became an independent university in 1970. The university has approximately 22,000 students. Kenyatta University is situated 23km from the centre of Nairobi, on over 1,000 acres of land. The university was established in 1985 after a long struggle for the status, which started in 1963. Strathmore University started in 1961 as an Advanced Level Sixth Form College offering Science and Arts subjects. The college started to admit accountancy students in March 1966, and thus became a university. In January 1993 Strathmore College merged with Kianda College and moved to Ole Sangale Road, Madaraka Estate, Nairobi. United States International University - Nairobi is a branch of the United States International University, which has campuses across the world. The Nairobi campus was established in 1969, with the first graduation taking place in 1979. The university has accreditation from the Western Association of Schools and Colleges, in USA and the Government of Kenya. Daystar University is a Christian liberal arts university in Nairobi, Kenya.